Star World 5 is the fifth and final Star World Level in the game Super Mario World, and is accessible by the Star Road in the Valley of Bowser. It takes place in the sky at night and features a rare yellow-colored Baby Yoshi. Star World 5 consists of one long screen, which the Player has 300 seconds on the Timer to complete. This level contains no Dragon Coins in the original, but in the remake, it has five. Like all Star World levels, there are two ways to beat this level. The player will start out next to a bunch of falling platforms. To get past this obstacle, the player has to jump off of each platform quickly to avoid losing a life Winged Koopa Troopas are encountered flying between some of the platforms. After the player comes to solid ground again, there is a blue P Switch, three Rotating Blocks, and a ? Block followed by a long space. The ? Block contains a Control Coin, which the player needs to control to make it go to the right. The ideal Control Coin would be one that goes up three or four coins, then turns right and stays right for its duration. After this, the player should hit the P Switch, which turns the coins into Blocks, and run on top of them as far as possible. The player passes more Winged Koopa Troopas and falling platforms before coming to a platform containing a Yellow Yoshi Egg. A few Spinies are found in between Warp Pipes, and Yoshi can be used to jump on Spinies without taking damage. A quick stairlike formation of falling platforms comes after a blue pipe, and then more Koopa Troopas and Spinies are mixed between pipes. The Giant Gate is at the end of this section. Beating the level this way will allow easy access to the Donut Plains. In order to find the Key and Keyhole, the player should have already completed the Yellow Switch Palace, Green Switch Palace, Red Switch Palace, and Blue Switch Palace, although it is possible reach the Key and Keyhole with just the Blue Switch Palace completed, or flying to it using Blue Yoshi and a Koopa Troopa, or simply by angling flight just right with a cape. To get to the Key and Keyhole, the player should get to the platform with the P Switch and Control Coin with a Cape Feather, and use the same strategy as before to make the Control Coin go right. The player should then take flight off of the Used Blocks that were previously coins going to the right, and land up high on yellow ! Blocks. The player should follow the trail of different colored ! Blocks to the end, which is where the Key and Keyhole are. (Alternatively, players can simply fly up with just a Cape Feather, getting a running start from a platform just ahead.) 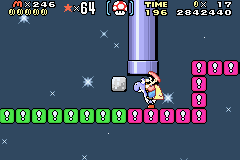 Beating the level this way will allow access to the Star Road that leads to the Special Zone.